There's no better way to mark a special occasion than with good food and in the company of friends! WINE TASTING, hosted by prestigious local wine merchants, can be added to your event, to enhance your culinary experience. 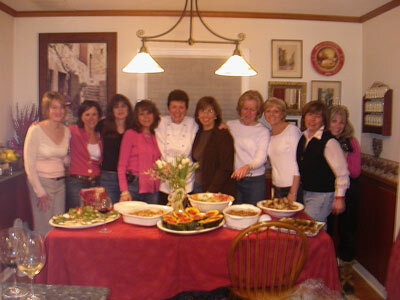 The Cooking Parties/classes can be taught in your home (or see under rental locations). Menu items can be mixed and matched according to your taste and desire to learn specific dishes. If you have a favorite dish of your own you'd like to learn how to cook, Chef Blažena will be happy to include it in your customized program. Fun for people passionate about cooking! You will learn a lot of tricks-of-the-trade explained from a professional chef and receive delicious recipes. If you prefer not to participate, you can lean back and observe Chef Blažena as she demonstrates the delectable creations. Watch your own "Food-TV channel" in your home kitchen, while you learn and party! Your guests or family might enjoy the meals as they come “off the stove” – or the menu can culminate in being served as lunch, buffet or a formal sit-down dinner. "Cooking With Friends" class or get-together is limited in number of guests, pending facility accommodation and the level of menu sophistication. Enjoy your "Home-Theatre" with a totally awesame experience, just with your family or invite friends for an evening to set you apart as a creative host. Dare to enjoy an evening of Art and Culinary Adventure!! Its fun! Its delectable! - and You do not have to cook! We'll cook either according to your movie selection (we can recommend a foodie movie) or prepare a dinner you are in a mood for! Newly-weds, Bridal Showers, Corporate "bonding" or entertaining clients, Anniversaries, "Girls Night Out", "Boys Night Out" (many great chefs are men! ), couples, or parents with teens, family get-together, or a unique birthday present for the person who has everything! Cooking Lessons or "Culinary Entertainment" is for anyone who likes to eat and learn to prepare exciting new dishes, spend time with friends in a relaxed and original way, or just learn skills which might lead to a new profession; or following a passion, and thus make you happy for life. Check out below some menu ideas, or compose your own either from the Culinary Affair Menu Sampler, or from your personal favorite dishes, or we'll customize a delicious program to delight your palate! Contact us for prices and classes content proposals. For my public teaching schedule, please check under "Public Appearances". Below are only a few ideas from so many delicious combinations we can learn to prepare and enjoy eating! Asperges au Beurre Noix (Asparagus with Toasted Walnut Butter: Great combination of flavors and a delicious spring entree starter! Lemon-Garlic Skewered Shrimp: An easy, impressive appetizer. Beautiful presentation of delectable fresh, marinated, grilled (or broiled) shrimp. Pork Tenderloin with Mushroom Sauce: Juicy pork tenderloin with flavorful cremini and white wine-Worcestershire sauce "Copenhagen" Almond Tart: This delightful tart is made quickly and ahead of your event. Make two and freeze one to bring along next time you are invited to join friends for dinner. Having "commuted" between Hamburg (Germany) and Aix-d'-Provence for almost 9 years, I present you here two examples from so many and guaranteed delicieux menus! Examples of the popular "Bistro" cooking, recreating the vibrant flavors of the simple French countryside, using fresh ingredients (available in our own gardens, local shops or markets). Burgundian Mushroom Cream Soup with a Touch of Cognac; Mixed Lettuce with Warm Cassis Vinaigrette; Boeuf Bourguignonne à la Classique Façon; Coq au Vin Blanc; Cassis Crisp - with French Vanilla Ice Cream, of course! Chef Blažena brings years of European cooking experience, delicious creativity and excitement to the table! She also will explain and hand out the definitions of favorite Italian sauces. Each session will consist of an antipasti, primi (first course), main pasta dish with homemade sauce and, of course, an Italian dolce. Mangia! Ribolita (Tuscan Vegetable Soup), Classis Tri-colore Salad, Linguine with Tuscany Meat Ragu. We finish with refreshing Cantaloupe in Anisette. Asparagus Vinaigrette with Roasted Peppers, Capellini alla Carrettiera (with Black Olives and Anchovies), Chicken in White Wine, with Prosciuto, Mushrooms Capers and Rosemary over Mostaccioli. As la dolce we'll enjoy Mascarpone with Rum-soaked Raisins. We'll learn how to prepare great menus to impress your guests and family! Most of these dishes are suitable for do-ahead and for open house buffet, to give you time to enjoy your company. Spinach Salad with Strawberries, Boneless Chicken Breast à la Suisse, Baked Confetti Rice with Water Chestnuts, Sunshine Carrots, and the finale is an absolutely comfort food dessert - Eastern European Apple Bread pudding with Vanilla-Rum sauce. Endive & Frisée salad with Pears and Balsamic Fig vinaigrette, Scallops with Bacon and Maple Cream, Sweet and Spicy Kielbasi, Roasted Vegetables & Chippotle Shrimp, culminated with Poached Cinnamon Pears in White Wine. Yummy! Happy Cooking, Happy Eating. Remember, that life is short and every day is a fête!